Typically, when we talk about conversions in the eCommerce vertical, we focus on the number of sales generated. Generating more sales is the primary goal for eCommerce businesses. Converting visitors into buyers is the key to success for your business. The primary goal of a purchase is always accompanied by smaller goals. Conversion experts call these small goals micro conversions. Micro conversions are the low-hanging fruits, precisely, actions that lead visitors to the end goal, that is, macro conversions. This blog focuses on improving micro conversions and how this improvement can impact the overall conversion of online stores. What Are Micro Conversions and Macro Conversions? Micro conversions are activities that lead your customers towards the larger goal, that is, macro conversion. A Micro Conversion is an action, or a set of actions, which provides a strong indication that a user is progressing towards a valuable action on your website. For example, if you are an eCommerce brand, a new user registration would be called a micro conversion. Why Should You Monitor Your Micro Conversions? Few visitors would buy a product on your website during their initial visit. Every visitor converts after a lot of activities, that is, a combination of micro conversions leads to a purchase. Here are the major reasons that depict the importance of a micro conversion and its impact on your overall conversion rate. The tricky part here is to figure out a way to segment your visitors. When you have a diverse pool of visitors, it’s imperative to understand the traffic you are dealing with. People can be flooding your website for a variety of reasons, as displayed here. For example, you can now figure out who are the people most likely drifting towards a macro conversion. A visitor checking out your career page might never buy from you. He or she is just checking out your website for career prospects. Such insights help you identify the perfect pool of visitors you should turn your focus towards, all thanks to micro conversions. When you categorize visitor actions on your website as micro conversions, you gain the opportunity to collect a lot of information about your visitors. Micro conversion provides you with the opportunity to diagnose the key areas on your website and optimize these as separate entities. For example, as one of the stages of your conversion funnel, a form signup is crucial. If there is a discrepancy here, your next action is to improve signups, which itself is a micro-conversion, a key area that needs to be rectified. 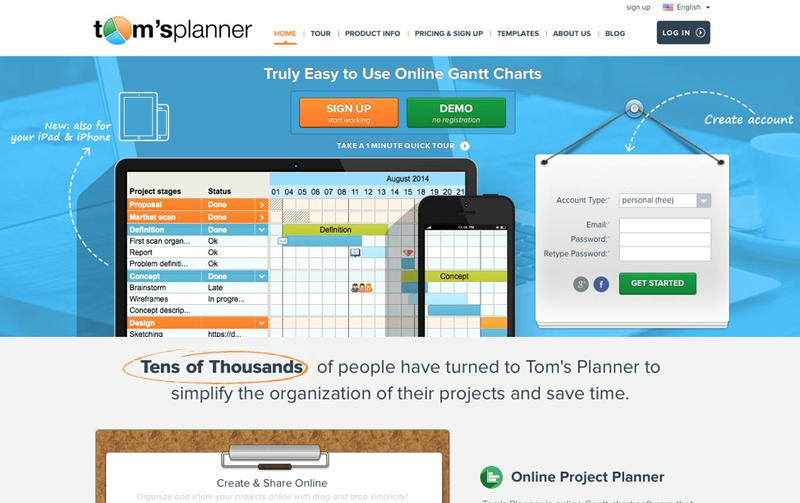 Tom’s Planner is web-based project planning software that allows visitors to create and share Gantt Charts and projects. Individuals and businesses can sign up for a free account on their websites and begin using the planner right away. Tom’s Planner wanted to improve its conversion rate. A free trial is a key area of focus for Tom’s Planner. With the help of VWO, Tom’s Planner implemented a test version of its homepage that included a signup form on the first fold of the website. This helped it improve the visitor to free conversion ratio by 43% percent. This is just one of a few examples that showcase how optimizing for micro conversions can lead to a better overall conversion. 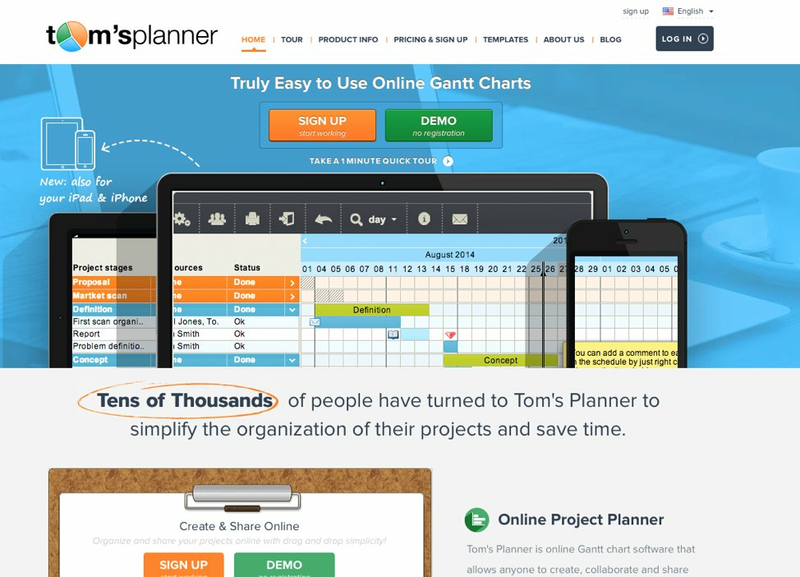 You can read the complete case study about Tom’s Planner here. When you figure out your ideal set of visitors, it’s important to take advantage of it by nurturing them. For example, people who sign up for your monthly newsletter on your website. Such micro-conversions provide the perfect “foot-in-the-door” moment to nurture these leads. Another example is exchanging an initial discount in exchange of a sign-up or email exchange. The discount might also lead to a transaction or might allow an online store to communicate with the visitor through email, thus improving the chance for a conversion. This micro-conversion strategy has been used by a lot of online stores. 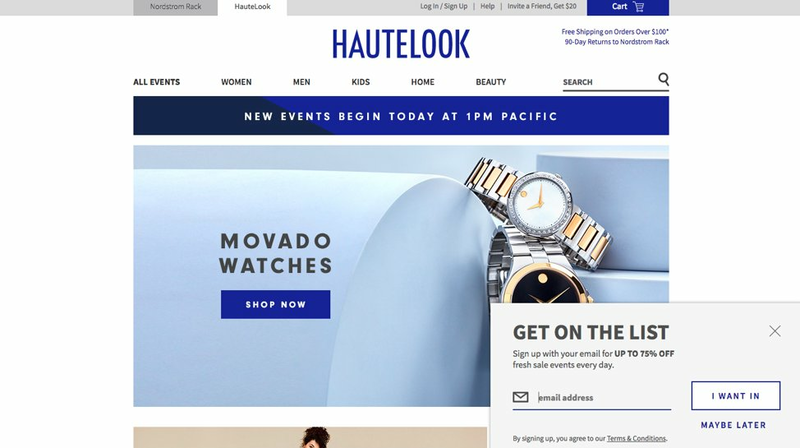 For example, HauteLook uses a similar approach to encourage its first-time visitors to sign up for their email newsletter. Also Read: How a simple tweak increased newsletter signups by 28%? A higher rate of conversion for these instances means that your audience is on track for the bigger picture. But what visitors should rather focus on post sign-ups is the interaction through these channels. These micro-conversions are a good indicator of all these channels and the ones most effective among these. A higher engagement on these channels or signups portrays a strong channel and how your content should be poised relative to your audience. It might have crossed your mind by now. Micro conversions are the perfect way to devise various conversion funnels for your online business. Think about it for a second about what we spoke at the start of this article. These are the actions that lead people towards a larger goal. By analyzing the right set of micro conversions in your business, you can figure out the journey your ideal set of customers takes. Land on the home page. Search for the preferred product (Micro). Land on the product page (Micro). Add the product to your cart (Micro). Sign up or log in (Micro). The customer journey for an eCommerce here, is mostly consisting of a series of micro conversions. By stringing together these micro conversions, you can come out with the conversion funnel for an eCommerce business. A customer’s journey is far from linear and when you bifurcate the customer journey into various micro-goals, you can concentrate on improving each aspect individually and indirectly improving your bigger goals. Micro conversions can and should play a vital role in your marketing efforts. These help you track the effort and efficiency of each marketing channel that you are utilizing. Yash works as a content marketer at VWO. His loves to read and write about SaaS business, CRO, eCommerce industry as well as consumer electronics. Apart from this, he is a huge foodie and an Android fanboy.